Using keyframes and layer animation, SU Animate lets you easily create step-by-step construction time-lapses for buildings, woodworking projects, architectural developments, etc. The following videos work through the process of creating timelapse animations in SU Animate. 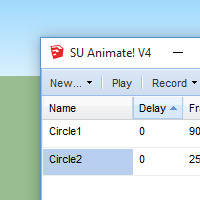 SU Animate User Interface - An in-depth overview of the entire SU Animate user interface. Explains all the functions in the main dialog, SU Animate toolbar, and how to create the various types of animation path. Vieo Tutorials - The easiest way to get started with SU Animate. We have video tutorials for all of SU Animate's major techniques and features. Learn how to create camera and object animation with keyframes and paths, and use layer animation to create assembly timelapses.